May 11 Welcome Binah Blue! This is little Binah. We got a new puppy this weekend. She is a Border Collie, blue in color, and she is a credit to her breed. (8 weeks and wicked smart, and very sweet.) She's named after the 2nd (or 3rd, depending on which direction you count) S'firah on the Kabbalistic Tree of Life. 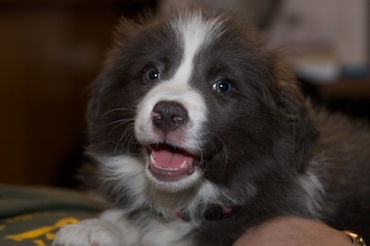 Binah means "Understanding" and that is the trait that seems to characterize Border Collies. Binah is my third BC. The first, Kayla has gone on to her eternal reward, and our second Gif (named after the web graphic format) is doing fine and just a little freaked out by this little blue whirlwind. Welcome, Binah!